The bash included cake, cards and even some Mummery. 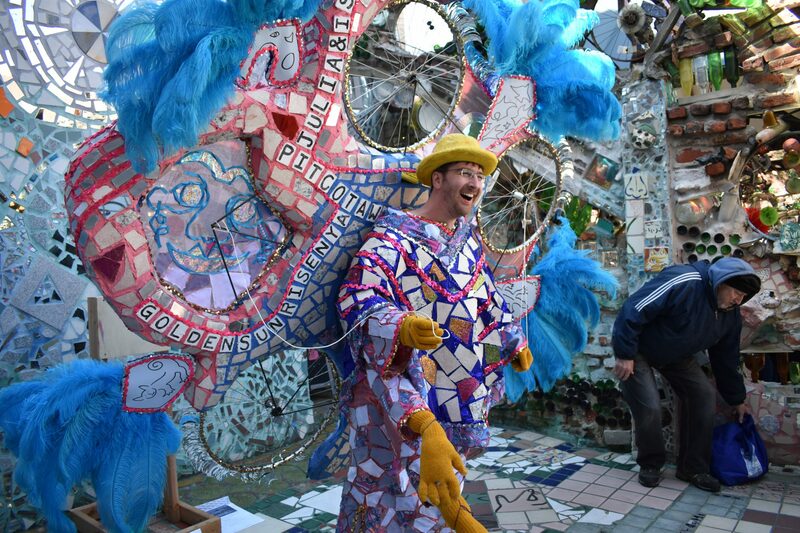 On Monday afternoon, Mummers and other art-enthused crowds convened among the seemingly endless mosaicked mazes of the Philadelphia Magic Gardens. Gathering in the courtyard of speckled glistening mirrors, folks encircled the visionary behind South Street’s imaginative haven, as the bustling event celebrated the 80th birthday of iconic mosaic mural artist Isaiah Zagar. For decades, the Philadelphia native has embellished the city blocks of his hometown with enchanting hues and motifs, accumulating more than 200 works of public art in neighborhoods across the region. PMG staffers felt saulting the prolific artist- whose work is nearly an omnipresence of Philadelphia – was certainly appropriate on this milestone birthday. While the birthday bash was naturally comprised of cake and cards, which included dozens of signatures, the party included a taste of the Pennsport neighborhood. Mummer Michael Carwile of Golden Sunrise New Year’s Association, which is the last remaining Fancy Club in the Philadelphia Mummers Association, strutted onto the scene with a mammoth 75-pound suit from the 2019 Philadelphia Mummers Parade. Inscribed with erratic rainbow patterns, plus the occasional feather and bicycle wheel, the backpiece was the recent brainchild of both Carwile and Zagar, as the two collaborated on the costumes after meeting through a mosaic art project at St. Thomas Aquinas Church in Point Breeze. The birthday bash featured a special appearance by Mummer Michael Carwile of Golden Sunrise New Year’s Association. For the 2019 Mummers Parade, Carwile and Zagar collaborated to create the NYA club’s costumes, including this 75-pound suit. A collision of two crafts, this was Zagar’s first time collaborating with the parade. PMG staff echo Carwile’s thoughts surrounding the parallels between mosaics and Mummery. Considering a common theme of a PMG exhibit rests in folklore art, the creativity of the more-than-century Philly tradition complements Zagar’s visions. Zagar, who accompanied Golden Sunrise on its march up Broad Street on New Year’s Day, wanted to highlight the impressive back piece for those who didn’t get a glimpse of it during the parade. Both Boyle and Smith stress the impact of Zagar’s decades of work – not solely on the city’s art community but also on the everyday lives of Philadelphians. From Kensington to Spruce Hill, the artist, who is heavily attributed to the “South Street Renaissance” of the last couple of decades, has adorned neighborhoods around the city with public art works, such as mosaicked alleyways, wrap-around mosaic murals and other individual murals. 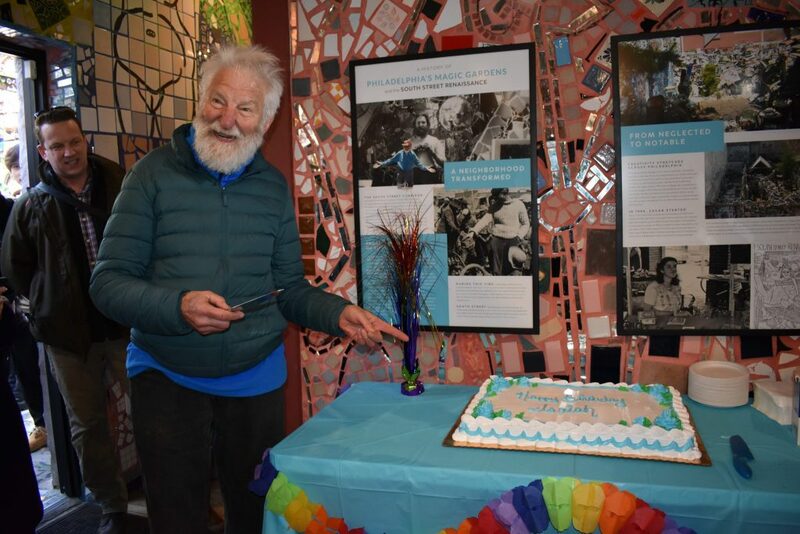 And despite turning, “80 years young,” as described by the PMG staff, Zagar has no plans to put down paintbrushes just yet. And the man of the hour’s thoughts on the jollity?